Wooldridge Creek Winery is located on over 200 acres in the renowned Applegate Valley of Southern Oregon. The land, which houses the vineyard and farm, includes 56 acres of planted grape vines and 150 acres of forest land on a south facing slope, surrounded by other vineyards, small farms, ranches, and public lands. Situated in the heart of the Applegate Valley, Wooldridge Creek Winery is about 30 minutes south of Grants Pass, and 45 minutes north of Medford. The area is a popular destination for hiking, rafting, paragliding, and wine tasting! The original vineyard was planted in the 70s by the original owners, Mary and Ted, who still live on the land and are involved in the business. Greg and Kara joined them as business partners in 2003 and opened the winery. They now live there with their two young children as well. Wooldridge Creek Winery makes estate wines and also does custom crush for many labels around the state and even the country. They are a very small operation with an extremely high production. It has been a great way to keep the label exclusive, but bring in many contracts to keep the winery profitable. 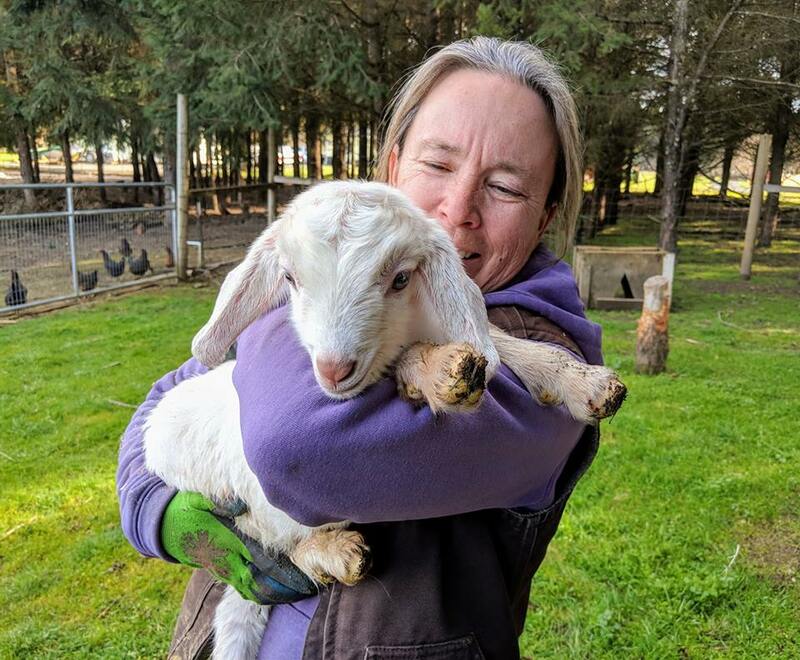 As well as operating the vineyard, Wooldridge Creek is also home to Crushpad Creamery, a small creamery making artisan goat and cow milk cheese. The creamery currently purchases cow milk from Noble Diary (certified organic) and also operates a goat dairy, which is currently located 40 minutes away at Pholia Farm in Rogue River. Pholia Farm is a 20 acre dairy farm and homestead located in the forest along Evans Creek and managed by Gianaclis. Gianaclis is a world leader in the field of small scale dairy operation and she established her farm on her childhood home after a long career as a nurse. Wooldridge Creek is excited to be moving the dairy operation to the winery property in late Spring/early Summer of 2019. Wooldridge dairy currently consists of 8-10 milking does (Lamancha, and Mini Lamancha) who are milked once a day. Cheese making happens 2-4 times a week. The whey from the dairy feeds pigs at the dairy manager, Gillian’s, nearby farm. The female offspring from the goats become future milkers and the males also go to Gillian’s farm for meat production. Many meat cuts from Gillian’s farm are incorporated into the Charcuterie at the winery. The restaurant garden has been going for 5 years and supplies seasonal vegetables for the restaurant, Vinfarm in Grants Pass, and also is a resource for the owners and employees. An RFC intern will join a lively crew of employees engaged at the winery, including tasting room staff, winemakers, cheesemakers, chefs, gardeners, and vineyard workers. Everyone is very friendly with each other and enjoy spending time together at work and in their free time. The internship at Wooldridge Creek Winery will be focused on learning about the goat dairy operation, with opportunities to learn about cheesemaking, gardening, vineyard management, and wine making as well. The intern will train alongside Dairy Manager, Gillian, a former RFC intern herself. Responsibilities will include milking 3-4 days a week, morning and evening farm chores 5 days a week, care of livestock including goats, chickens, mini horse and donkey, helping out during kidding season, and caring for baby goats including bottle feeding. Dairy production will involve milking, milk machine maintenance, and safe food handling procedures. Training will be very heavy in the first few weeks including working at Pholia Farm, managing baby goats and learning how to use milk machine. General training schedule will be 5 days a week 8am-mid afternoon with a long break in the afternoon and an hour in the evening prior to dark to put the animals away for the night. Approximately 35 hours a week. Two full days off a week. Housing will be provided in the Carriage House, which is a private one bedroom cabin located on the winery property, and includes an efficiency kitchen (hot water, hot plate, toaster oven, microwave, fridge) with access to a full kitchen 2 minute walk away in the tasting room. Living room with fireplace, bedroom, full bathroom with tub and wifi. All food preparation will be the responsibility of the intern, there are no shared meals (except during grape harvest Sept-Nov, when lunch and dinner is catered for all employees). Eggs provided from our chickens and seasonal produce is available for self-harvest from the garden April-Oct. An additional stipend will be provided for extra food cost. Whistling Duck Farm Store is a short drive away. Coffee and tea are provided at the winery along with a “shift drink” after clocking out for the day for those over 21. Bottles of are available for purchase at 50% discount. Personal vehicle is not mandatory, but encouraged, we have no transportation out here. A winery vehicle will be available upon request if intern has no transportation. Details of the stipend package will be discussed during the placement process. No experience needed, but must be 21 or older and have an interest in, and be comfortable working with, animals. Must be capable of lifting 50lbs. Must have valid drivers license and a clean driving record. Runnymede Farm is a diverse, bio-intensive farm located in the beautiful Evans Valley of Southern Oregon, right in between the town of Rogue River, and the river itself. The farm uses intuition and intensive, chemical free, non-certified organic practices to produce a wide variety of crops on their 10 acres, including vegetables, fruit, cut flowers, nursery plants, eggs, cow and goat milk, and pork and chicken meat. They also do a variety of value added products such as dried fruit, garlic braids, and ferments. Runnymede sells at the local farmers markets, as well as on site. The land, which was a former Christmas tree farm, also still hosts a woodlot in the back of the acreage, which is managed for firewood. The farm is run by husband and wife team Art and Teri White. They have over 30 years of farming and market experience. They have been on the land since 1999, running the farm and raising two sons, who are now grown up and live nearby but do not farm. Teri and Art are independent, liberally minded people, who still hold many old fashioned values. Although they describe themselves as spiritual, they practice no form of organized religion. They appreciate the farming lifestyle, and believe that hard work can be enjoyable is not to be shunned or avoided. They are joined on the farm by one full time employee, and two long term, seasonal, part-time employees, as well as interns, with the crew ranging between 2 to 10 people depending on the time of year. Due to the scale of their farm, field prep is done with a tractor, while all other tasks are performed by hand with basic tools. Interns joining the crew at Runnymede can expect to be exposed to all tasks involved in running a small scale, diverse, mixed production farm, including care of livestock, milking and milk handling, planting, cultivation, harvesting, and selling at market. Additionally, there are a variety of construction projects available for interns to participate in if they are interested. On farm training time consists of a standard 40 hours/week, but includes weekends. Interns will work alongside the Host Farmers or with experienced farm employees. Interns are also encouraged to pursue their specific interests within the farm operation, since there is such a diverse array of things happening. The farm includes several outbuildings and barns, as well as living quarters for employees and interns. Interns will have separate accommodations from the main house, in either a trailer or separate room. There is a common space and kitchen that’s shared between interns and farm employees. The farm will provide staple foods, including milk, eggs, and produce from the farm, with some meals eaten together. Vegans, vegetarians, or others with dietary restrictions may need to provide some of their own food. A monthly stipend will be provided as well. Details of the room and board and stipend package will be discussed during the interview and placement process. Because of all the animals that already call Runnymede home, they cannot accommodate other pets. Runnymede is seeking intern applicants who are mature, capable of working independently as well as living communally, and bring a positive attitude to the daily rigors of physical farm work. They encourage interns to explore and enjoy Southern Oregon, make friends outside the farm, and make the most of their experience. Sweet Water Farm is located on 18 forested, sloping acres in Hugo, Oregon about 15 minutes to both the town of Grants Pass and the Rogue River. Sam and Denise manage the farm tasks with their son and daughter, Ari and Ivory, tagging along. Sam’s brother Jess lives in another house on the property. A few dogs and a couple cats round out the domestic creatures. There are a handful of chickens pecking away and plans to raise a pair of pigs this upcoming season. Sam and Denise love and appreciate the life farming has given them and are excited to share what they have learned in 14 years of growing food and working towards efficient, holistic land management. The farm cultivates a little less than an acre of land and although not certified Organic, use methods nearly identical, applying certified Organic fertilizers, composts, and amendments. The site is sloping and very wet from late fall to late spring which has led them to grow in 75 foot permanent raised beds and rely on the smaller BCS walking tractor for bed preparation. They also use tarps for preserving clean beds and the broad fork for working the soil deeply and have been moving towards more use of the power harrow in place of rototilling and annual applications of compost, finding success in minimal tillage methods popularized in part by J.M. Fortier in Montreal, Canada. Sam and Denise also lease a half acre of flat land with 200 foot beds, where they use a small four wheel tractor for bed prep and grow potatoes, onions, and winter squash. They also have a small orchard of fruit trees and berries, as well as a perennial asparagus patch. Sweet Water grows produce and flowers for the Grants Pass Growers Market, as well as a few local restaurants and stores. They aim to continue delivering an exceptional product to our community and are looking forward to teaching a single intern, possibly a couple, all of the steps necessary to achieving this. Interns will be integral to the success of Sweet Water Farm during the 2019 farming season. Interns will start slowly, learning the layout of the land and the overall plan and design for the year. Sam and Denise will work with interns to teach various jobs, provide feedback, and help with the mastery of tasks. As skills are developed, interns will work more independently. Spring will start with tasks such as making soil blocks and seeding of the upcoming crops. Mowing and string trimming of grass. Methods of bed preparation, transplanting, and weeding will soon become weekly tasks. Trellising of intense greenhouse crops of tomatoes and cucumbers will also be taught. Around late May, markets will begin as harvesting, processing, and packing of produce become a task for every Friday and Saturday. Safe and efficient use of the BCS tractor as well as the various implements for mowing and soil preparation will be taught if the intern is interested. Time will be set aside for check-ins to discuss successes, challenges, needs or disagreements. Interns will be regarded as important members of Sweet Water Farm and valued for their input, observations, and insights. Interns will be expected to work 35 hours a week, split into five 7-hour days, with two days off per week. Tasks may be physically challenging and repetitive at times, but interns will not be asked to do anything Sam and Denise have not done countless times each year. Sam and Denise will work with interns to learn body positioning and efficiency which will help to grow food and become physically strong at the same time! In exchange for power and energy Sweet Water will provide interns with a small cabin with electricity, kitchen, shower, and composting toilet. They will also provide basic, healthy staples (such as beans, rice, oatmeal, peanut butter, bread, and some meat, milk, eggs, butter, and cheese or vegetarian versions) as well as produce from the garden. Interns will mainly cook for themselves, although there will be occasional group meals. A stipend will be paid at the end of each month. Times to access laundry facilities, the home computer/internet, and swimming pool at the main house will be scheduled. Details of stipend package, room, and board will be discussed during the interview process. No experience is required, as long as interns are open to engaging in all the tasks a farmer does including hard work and repetitive motions. Attention to detail and willingness to listen to feedback are important, as well as an overall positive attitude and excitement to learn! By George Farm is located on 85 acres nestled at the banks of Yale Creek and Little Applegate River. We’re located just past where the pavement stops. The farm includes a creamery, a greenhouse, a pair of hundred year old barns, the original one-room-schoolhouse, tool sheds and machinery storage. There is a wood-ﬁred sauna, a creek-fed cold plunge and many trails covering the area. We are pretty far out of town but the locals are always near. Currently the farm is occupied by its farmers Tyson and Jonny, their sister Megan, plus a variety of farm animals. We focus on stacked sustainable systems - starting with pasture management and the use of dairy cows to graze the majority of the land. We raise grass-fed Jersey cows that we milk daily, and make artisan cheese for the local markets. We also raise pastured, no-corn-no-soy-no-gmo laying ducks for eggs. Additionally we have a flock of Gotland sheep for fiber and lamb meat. In addition, we cultivate a home garden and maintain food preservation. While we strive to comply with all current organic standards we have made the conscious choice to source grain from regional non GMO sources. While our feeds are not certiﬁed organic the are “no-spray” and non-GMO. All other farming methods are practiced organically or naturally. We have been operating for 6 years. We’ve grown vegetables for ﬁne dining restaurants, CSA’s and farmers markets. While we now focus on dairy, we integrate multiple facets of farming. Vegetables: Home garden from starts to preservation. Dairy: Calving to breeding, grazing and feeding, hooves, tails, udders and milk pails. Creamery: Cheese-making, packing, affinage (cheese preservation), dishes. Meat production: Breeding, calving, grazing, feeding, animal handling and care, as well as harvesting and processing. Sheep: Feeding, pasture grazing, fiber harvest and fall meat harvest. Marketing and Sales: Farmers' Markets, deliveries to stores, restaurants, and wholesale distributors. Our students will need a willingness to learn and an interest in food systems. Large animal experience preferred. Milking experience a plus. We get up early with the cows to milk in the morning and in the evening. We usually take a rest in the middle of the day. We move 7 gallon milk cans and 100 pound bales. Our “mobile egg units” or MEU’s are moved everyday but are light enough for one person. We have a stick framed tiny house and a strawbale tiny house, an outdoor kitchen and composting toilet. Shower facilities located in the main house. The interns live in the tiny house space, and all members of the farm have access to dairy, meat, and vegetables produced here. We will also provide basic cooking ingredients and staples. Further details of the room, board, and stipend package will be discussed during the interview process. We are participating in RFC to educate and give hands on experience to those who see agricultural opportunities. As alumni to the program we see the need to continue the education of new farmers, and are able to understand the concerns and challenges of our students. We train alongside our students and teach by example. We also have a fully stocked library for students to use for research. We believe that through hard work and determination we can restore the pride and nobility that comes with feeding our communities.